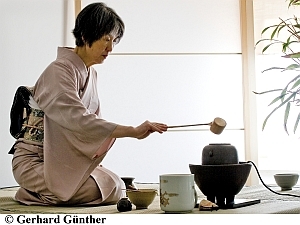 The tea ceremony has been known in Japan as a special form of hospitality since the 16th century. It was initially imported by a Buddhist abbot who tried to induce his debauched master, the shogun, to refrain from drinking so much sake. Tea master Sen-no-Rikyu further developed the tea ceremony into a “unique way of life” with the highest spiritual and philosophical standards, giving it the reputation that it still has today of being the essence of Japanese hospitality. IORI Tea Ceremony Kulturhaus will present a short introduction to the history and tradition of “the way of the tea” as well as the special art of flower arrangement (chabana) for the tea ceremony. Also enjoy Japanese sweets and green matcha tea.